This year we've had 92 days above 90°F (32°C) crushing the old record for really hot summer days, which have now dragged on into the fall. Today's forecast calls for a high of 95°F (35°C). The hot weather has been great for some plants in my vegetable garden but not so good for others. Overall, so far, it has been a successful year and I've been able to eat lots of home grown organic produce. I've had fresh tomatoes, hot peppers (habanero, jalapeno, cayenne and banana peppers), sweet peppers (bell and banana peppers), three varieties of eggplant, zucchini, okra and an assortment of fresh herbs. 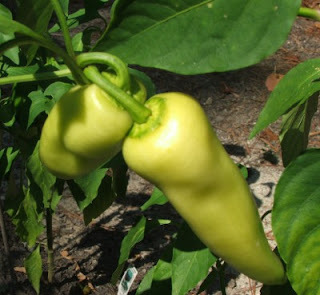 The hot weather seems to have been especially good for the hot pepper plants. In past years I've planted as many as four habanero pepper plants which produced more than I could eat. 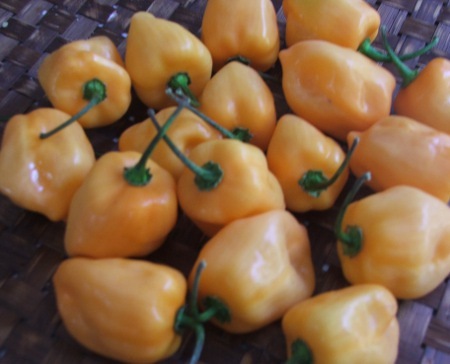 I give any excess produce to friends and neighbors but everyone is afraid of the habaneros. They think they are just too hot. This year I grew just one plant but it turned into a huge habanero bush, the largest I have ever seen, and I am getting as many habaneros as I ever did in the past. Fortunately I've learned how to control the heat. For example, I had brunch with my housemate and cooked omelets and potatoes. In my veggie omelet I diced up half a small habanero without the seeds. That added just a little bit of a kick and a really nice flavor. I'm using habaneros in just about everything you can imagine this year, cooking with them more than ever before, and really enjoying the results. I also made my own habanero salsa for the first time this year and it came out really good. In general I've had plenty of fresh veggies constantly since late June. (OK, tomatoes and peppers are fruits but you know what I mean.) Around here we sometimes get well into November without a freeze even in a normal year so I hope to get another couple of months of production out of the garden. However serious global warming may be and however much Americans seem intent on denying it or ignoring it, at least this year's garden is one small short term benefit. Tonight at sunset is the beginning of Yom Kippur, the Day of Atonement, the holiest day on the Jewish calendar. Observant Jews fast for 24 hours and go to services. It is meant to be a day of prayer, reflection and repentance. There are three forms or good wishes I see around Yom Kippur every year: a wish for an easy fast, a wish for a meaningful fast, and the more religious Gmar Hatima Tov, a wish that the person receiving the greeting is inscribed in the book of life for good. While roughly 70% of Israel's Jewish population is categorized as secular I read this week that only 6% refrain from observances during the High Holy Days. I believe it is the same for many American and other diaspora Jews who disregard observance during most of the year. Rosh Hashana and Yom Kippur are different. So... if you are observing the Yom Kippur holiday this year, may it be a meaningful fast and a meaningful day for you. Last October, after my third Sylvania netbook failed, I took the refund I had received and bought an HP Mini 110 netbook as a replacement. I ordered directly from HP and customized the little machine to my needs, choosing a 16GB SSD over the 160GB conventional hard drive. I also chose to upgrade the machine to 2GB RAM but did it myself with after market RAM rather than pay HP's rather inflated price for memory. My system came preloaded with Ubuntu 8.04 (Hardy Heron) and HP's now defunct Mi interface. I've now had the machine for just short of 11 months and I am still completely pleased with it. In my various articles about since late 2008 I've had numerous comments about how netbooks are really toys, how they are underpowered, how they can't do real work, and so on. I have a one word reply: nonsense! Oh, perhaps they are underpowered when running Windows, a bloated and overly resource hungry operating system. Running Linux, as in any of a variety of distributions, there is nothing I can do with my desktop that I can't do with my HP Mini 110. Video editing? No problem. Compiling software? Yep, just fine. Writing with the little, built-in keyboard? I do it all the time. The netbook isn't as fast as the desktop when I use resource intensive applications, of course, but the portability has made it a constant companion for me. I also write Linux distribution reviews now and again for either O'Reilly or DistroWatch. The net result is that I have installed and tried probably far too many distributions on the little machine. All of them except for openSUSE 11.2 worked well. (I have not tried a newer openSUSE version yet.) I did find some distros require that a parameter be passed to the kernel in order for the installer to boot properly. The most frequent complaint I've read online from folks who install Linux on the HP Mini 110 is that some have problems getting Broadcom 4312 wireless to work with some distributions. I've found that Ubuntu works out of the proverbial box and on others I need to add the proprietary Broadcom STA (wl) driver. Some distributions package the driver (i.e. : Pardus) but most do not. If you are relatively new to Linux you probably want to stick to Ubuntu or one of the derivatives that use the Ubuntu repositories. The Pardus wiki also has good instructions for getting wireless and the 3G modem going. If those instructions are clear to you then Pardus is another distro that is quite easy to use on the Mini 110. A more advanced user who is comfortable at the command line, with editing configuration files, and with compiling software should be able to make almost any Linux distribution work well with this system. I am currently using SalixOS 13.1 as my primary Linux distribution on the netbook. That is, as always, subject to change. It did take me a little while to get used to the keyboard but the small size was not the issue. I don't mind a small keyboard. This netbook actually has larger keys than my old full size Toshiba laptop did but the keys aren't beveled: they are completely flat. Until I got used to typing on the HP I made more errors with this keyboard than I did with the smaller Sylvania netbook. Now that I've had the HP Mini 110 for 11 months I can type at full speed on the keyboard and it seems perfectly natural to do so to me. The screen on the Mini 110 is bright and easy to read even without my reading glasses. Battery life is OK, at something under three hours, but I have not upgraded to the long life battery pack. I am still using just the stock pack that came with it. The Sylvania was better in this respect. In summary: everything just works for me and works well. The HP Mini 110 is rugged enough to go anywhere and it has been 100% reliable for me. I like the SSD because the system is all but silent and the performance seems to be every bit as good if not better than a conventional hard drive. 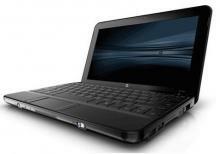 Why write about a discontinued netbook now? Well, for one HP has a very similar model (the Mini 210) for sale. Second, there is always the used market. Finally, I've actually used the thing long enough to write in an informed way. It's a pity HP no longer offers Linux preloaded. If they did I would recommend their netbooks to anyone. This evening at sundown is the start of Rosh Hashana, the Jewish New Year. It is also the beginning of the High Holy Days for Jewish people, 10 days of reflection and penitence. It is the start of the year 5177, a year that is shaping up to be interesting to say the least. I would like to take a moment to wish everyone Shana Tovah. May the coming year be happy, healthy, prosperous and sweet for you. Ground Zero Mosque? What Ground Zero Mosque? As the debate about the building of a mosque and Muslim community center in lower Manhattan rages on I have to wonder how much of this has been deliberately fueled by the media for their own profit. I can understand why ideologically driven opponents of the project would falsely label it a "ground zero mosque" to prey on the emotions surrounding the attack on 9/11/2001. The problem is that much of the press, both on the left and right, are willing accomplices who sensationalize the story to sell papers or boost ratings. The fact is that there is no mosque proposed for the site where the World Trade Center stood, or ground zero. There is no Muslim community center proposed across the street or around the corner, either. It's two blocks away. That isn't "in the shadow of ground zero." (A hole in the ground doesn't cast a shadow, does it?) The project, when completed, won't be visible from ground zero. If and when the Freedom Tower is finally built if you go way up on a nice, high floor then you will certainly see the new Park51 community center among the many other buildings in lower Manhattan. The Associated Press, to it's credit, sent out a memo instructing staff not to use the phrase "ground zero mosque". Some other news organizations, including The New York Times and MS-NBC have scrupulously avoided misleading people about the location as well. Well-intentioned people of good faith can disagree on this issue. There are arguments that can be made on both sides that are not representative of bigotry or intolerance. I have my own opinions which I will be sharing at length. Before I do that, though, let's at least agree to stick to facts and not allow hype and hyperbole to inflame what is, by nature, a heated discussion.